Early in Too Big To Fail we see Henry Paulsen looking through binoculars at a Red Tail Hawk soaring through the sky; the former kings of the financial industry sailing through the unregulated markets. As the film presses on we will soon see that the industry may never be able to reclaim such freedom, or will they? The film is an HBO production, meaning that the politics of production and exhibition are severely reduced, and in classic HBO fashion, the film is poignant and informative. The film primarily follows the events as they unfolded through the eyes of Secretary of Treasury Henry Paulsen from August to October 2008, with some scenes breaking away from that point-of-view. Paulsen finds himself in the middle of arguments and childish squabbling in order to find buyers at the last minute for the largest failing banks and investment firms. Paulsen passes his attention between dozens of people per day in order to keep the nation’s economy afloat. No matter what can be done with governmental powers it is all Catch 22. Director Curtis Hansen is in top form, as the film benefits from the use of cool blues that denote the cold demeanor of the financial industry; cold, emotionless, self-centered. The cinematography is smooth and calm, the necessary emotions for the characters to navigate themselves through a labyrinth of failed advanced investment products and strategies. Like Metropolis, Too Big To Fail shows how the men who controlled the upper class were ignorant of the systems that kept them in power. With such abuse comes the toppling of an imbalanced structure, but this time, the government was there to catch their fall, and the government took the hit from the plunge due to flailing arms. 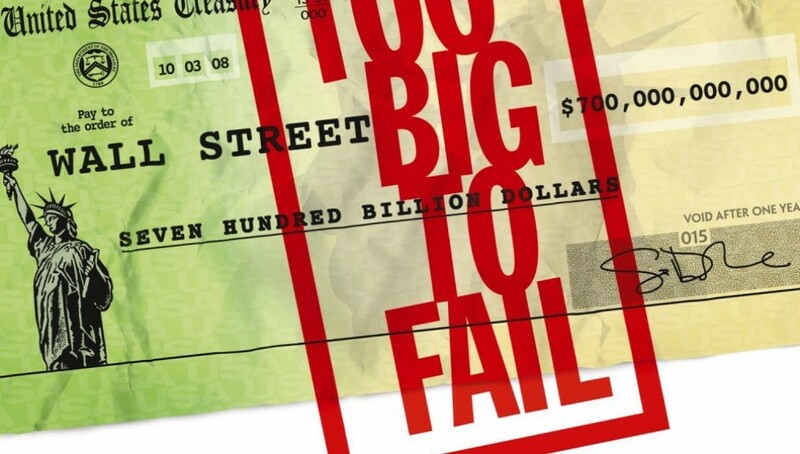 The giants of the banking and investment industry are played by the modern giants of American acting. An ensemble cast ready to portray the ensemble of thieves and crooks that perched above Wall Street.Paul Giamati as Ben Bernake steals the show. Most of the times Bernake has lines, Giamatti delivers them like they are the words from a prophet, the epic soundtrack often times supports the grandiose nature. Paulsen first makes the populist choice and is essentially crucified by the markets for doing so. But when Lehman Brothers was merely the beginning of the end, populism had to be tossed out of the window for a more socialist approach. But Bernake put it into perspective, in order to stave off a financial collapse that is unfathomably worst than the Great Depression, plentiful access to credit would have been necessary. The film puts it simply: “Why weren’t they regulated?” “Because they were making too much money.” Despite the lesson told directly to our faces, countless times, our nation now faces the same resistance to regulation. The question at the end of the film, while paltry, is a stepping off point for the larger story that would unfold throughout late 2008 and 2009. If the banks abused their freedom before, why would they ever learn from their mistakes now? 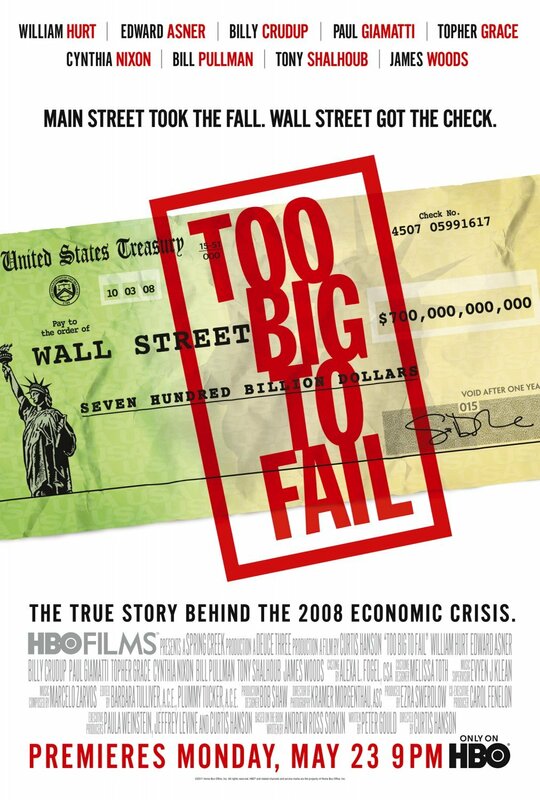 While we all know the answer and the outcome beyond the events in the film, Too Big To Fail places the events into a perspective and packages it up neatly for easy consumption, similar to the documentary film Inside Job. That is not to say that the story has been dumbed-down, in fact, the film should smarten HBO subscribers and provide a better understanding to why their 401K has been poor.